We truly feel this story shows the positive bond hunting can build between the beginning hunter and his/her parent. Jim Watson shows us all the right thing to say to a junior hunter when they miss. Such an excellent example deserves more than just an appearance on a page in WesternHunter.com  both Timothy and Jim Watson will be sent the soon-to-be released WesternHunter.com t-shirts. 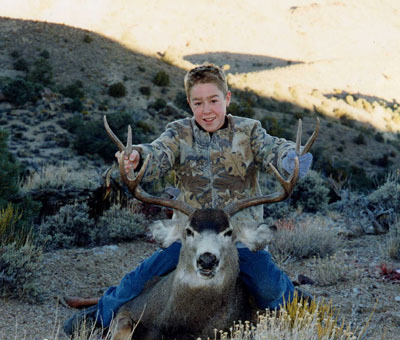 I turned 12 years old just a few days too late to apply for the 2000 deer season in Nevada, but I was lucky and got a leftover youth tag after the main drawing was over. The only area with leftover tags was one in which my family had mostly hunted chukar. My dad calls it the "Badlands" because of its sparse trees, and rolling hills and valleys covered in sagebrush. Dad told me that the area wasn't known for its deer hunting, but in years past my family has seen some big mule deer bucks in the area. The first morning of our three-day hunt we walked from camp and headed into some higher country. The Winchester 30.06 was awkward at times but Dad said that I handled it pretty well. We had practiced quite a lot and I felt confident that I could make a good shot if I got the chance. That evening we road hunted and didn't see a thing. We decided that the next morning we would hunt a different mountain range about 20 miles across the valley from where we camped. This meant waking up even earlier, but I was ready for it. We left camp at 4 a.m. and drove until it got light enough to see. My dad found a place where he wanted to take a walk and we headed out once again. We had been walking for about 30 minutes when again he said, "Get ready!" but this time he added, "I see a buck!" My heart began to race as he helped me locate the deer. He said that the deer was about 200 yards away and looked like a nice 3-point. Just as I settled in to take the shot, Dad said "Tim, Wait!" Another deer appeared on the ridge and it was a big one. I quickly located the other deer and took the shot  only to miss  and the deer went out of sight. My dad looked down at me, smiled and said, "Don't worry about it, I've been there." He then suggested that we hustle up to the place where we had last seen the buck. As we looked down into the next valley, we spotted the deer about 100 yards below us. There were at least two bucks and several does, but all I saw was the big one. I kneeled once again and squeezed the trigger. When the gun fired, Dad said, "That deer is hit," as the big buck stumbled out of sight. We had walked about 10 steps when I spotted the deer lying motionless on the ground. The big buck had ran approximately 20 yards and fell dead from a shot right through the heart. I'm not sure who was more excited, me or my dad. My first mule deer was a 4x4 with a 28 1/4 inch spread. My dad is having it mounted for me as a reminder of this great hunt, and the fun time we spent together hunting for this trophy "Badlands' Buck." I can't wait until next season! Editor's Note: Timothy wrote this story himself and only needed a little help from his dad, Jim Watson.